We continue to explore some of the treasures in the historical city of Ayutthaya. 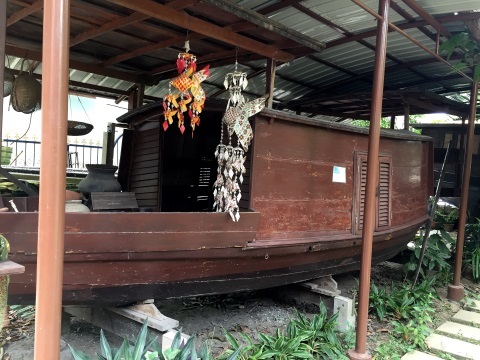 This month we feature a visit to a museum established by a man who grew up with boats, loved boats, dedicated his working life teaching boat design and building and converted his home to a museum to preserve old Thai boats. Welcome to the Thai Boat Museum, Ayutthaya. Ajarn Paitoon Khaomala, a native of Ayutthaya, grew up in an age when boats and waterways played a dominant role in the lives of the people in Ayutthaya. As a boy, he paddled his boat to school, a practice he continued into his working life. A teacher by profession, he taught boat design and boat building at the Ayutthaya Boat Building School, currently the College of Industrial Boat Building. He retired in 1996 after 38 years of service. 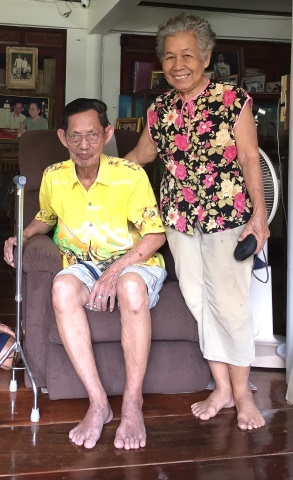 In his lifetime, Arjarn Paitoon experienced profound changes to the mode of transport in Thailand resulting from economic and infrastructural development. Roads and land transport soon displaced boats on the waterways. The use of boats diminished and with that an important historical and cultural feature of Thai society faded from memory. It was Ajarn Paitoon’s dream to preserve these memories for future generations to learn about the way of life of their forefathers. When he retired, this dream was realised. 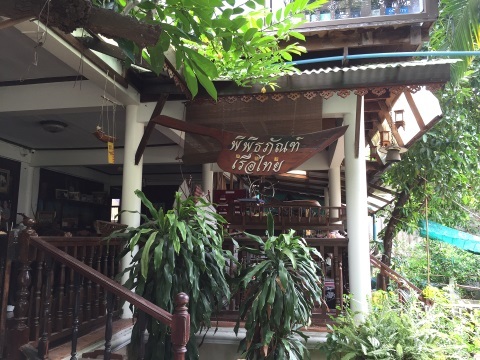 With his retirement funds and proceeds from the sale of his home in Pathom Thani, he built a Thai house in Ayutthaya as his home and museum. 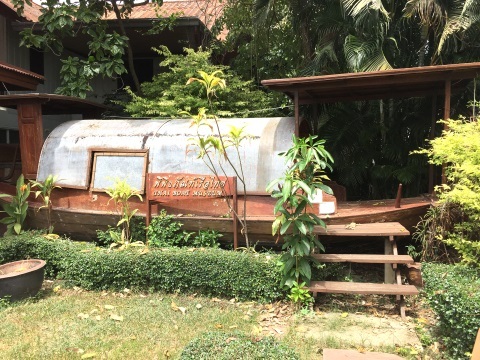 In 1995, the Thai Boat Museum was founded to preserve the knowledge of Thai boats for posterity. 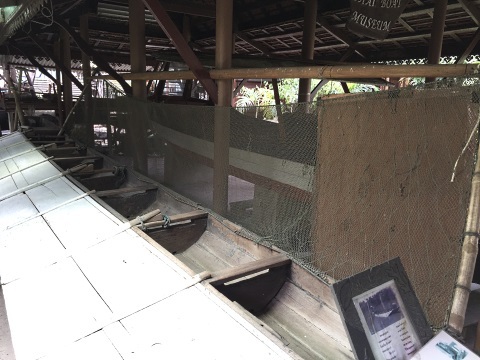 Old rice barge* (Rua Krachaeng), an outdoor exhibit at the entrance to the Thai Boat Museum. *This is a relatively large boat with a broad hull and flat bottom to maximise storage capacity and minimise the draught. Rice barges are constructed with thick teak logs held firmly by wooden pegs. The roof over the deck is removable by sliding it off and there’s a flat roof at the stern to shelter the coxswain. These barges were used to transport rice from the rice fields upcountry to the markets and port. This mode of transport is still being used today except that larger flat-bottomed metal barges are used. 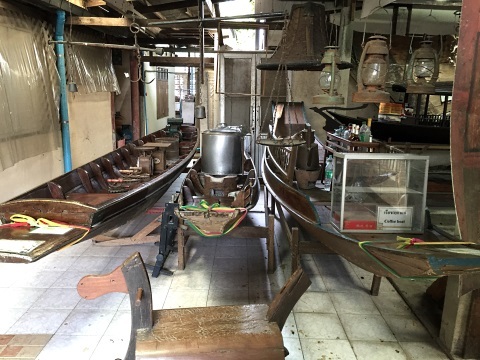 To identify the different boats, their features and functions, I’ve referred to the booklet “Thai Boats and Life on the Waterways” by Ajarn Paitoon Khaomala and his son Kanok. Dug outs – these are boats made from hacking out the core of a tree trunk for use as a boat. Boats that are built from scratch starting with the keel, adding the ribs, hull, decking, using mainly wood. For some boats, special designs are added for the bow and stern giving them distinct looks. 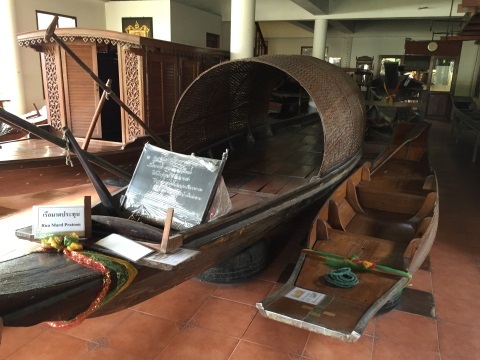 Let’s take a tour of the exhibits in the Thai Boat Museum. Rua Chalom is a sea going sailboat that’s constructed with a raised bow and stern and a round hull. 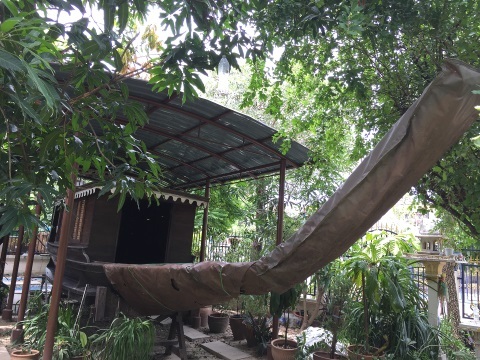 The deck is fitted with an arched bamboo roof and a forward sail which is soaked in the sap of the ebony tree for durability. Such boats are used to transport sea food, prawn paste, fish sauce and salt from the coastal provinces of Samut Prakarn, Samut Sakorn and Samut Songkhram to markets in the Central Region via the Chao Phraya, Tha Chin and Mae Khlong Rivers. These long journeys were taken with families on board. As a matter of interest, the “chalom” is on the official seal of Samut Sakorn Province and the district of Tha Chalom in this province is named after this boat. These are very slender boats with curved hulls made with overlapping planks. They were used as a life boats aboard warships in the old days. Later they were adapted for everyday use and also for boat races. Rua Phai Ma is a dugout or a boat made by hollowing out a tree trunk. The bow and the stern are shaped to curve upwards and because of this feature, are called “rabbits’ ears”. A layer of wooden strips line the hold from bow to stern almost level with the gunwales. 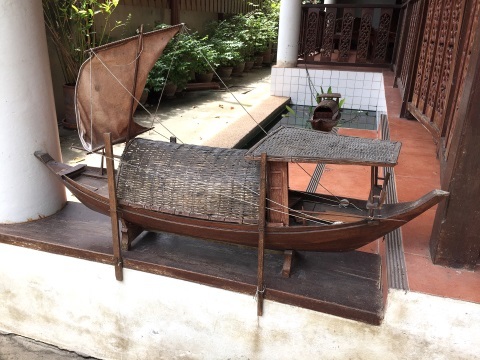 This kind of boat was used to transport goods towards the end of the Ayutthaya period. Bigger versions of this boat were fitted with roofs for people to live on board. Rua Mard Prathoon is another example of a dugout made from teak wood. It was a roof over the middle section of the boat that serves as a living area for passengers on long journeys. This boat is propelled by an oarsman at the stern and another at the bow. For the bigger boats entering shallow waters, buffaloes on the banks are used to pull the boat. This is similar to the horse drawn canal barges in the UK during the 18th C.
Rua Pong is a dugout made from splitting the trunk of the Palmyra* palm lengthwise and removing the inner core till the bark is left. A plank is used to stop up the stern. Sometimes teak is used for a more durable version. Such boats are useful for moving about in shallow waters or along the fringes of flooded rice fields. *The fruit of the Palmyra is used to make a sweet drink and a variety of deserts. The sap from the top shoots of the Palmyra is collected in earthen pots to make toddy and arrack alcoholic beverages. Almost the entire ground floor of the house is used to display the various boats. Here are some more exhibits along the way to the next section of the house. 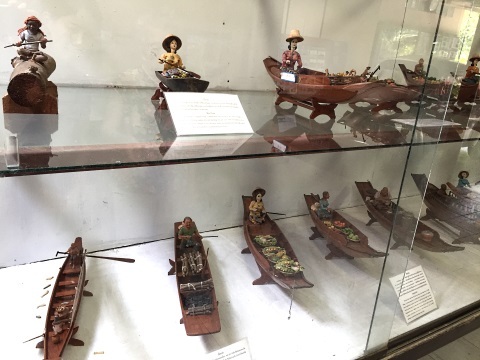 These elaborately made model boats are colourful illustrations of the various functions of these boats in the old days; for personal transport, for boat vendors selling their products, for transportation of goods, fishing etc. Since the waterways were the main routes of travel, even food and beverages were delivered by boats, like the noodle boat and the coffee boat. 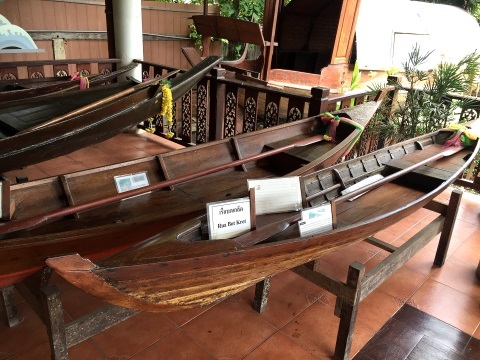 The sampan is a familiar name for a small boat used in many parts of South-East Asia. It’s actually of Chinese origin and used as a life boat on board the Chinese trading junks or to travel from junks anchored off-shore to the beach. One version of how this name was derived is because the original boat was constructed by joining three planks, hence sampan. 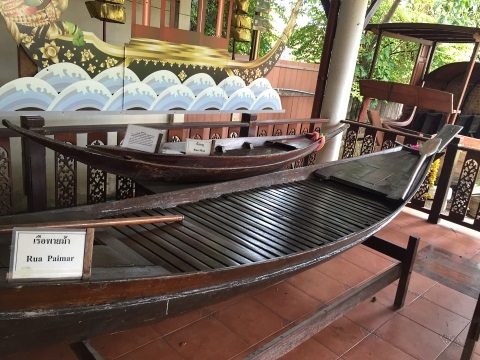 Such a boat was very useful for travelling in the numerous canals, ditches and flooded rice fields in old Siam. These flat-bottomed boats were constructed in various sizes to meet different transportation needs, personal transport, water taxis and boats for goods. This next boat has got an interesting name, (phi – ghost, lok – to be tricked). A look at the features of this boat and its function will clarify the reason for this name. The Rua Phi Lok is a long fishing boat built with a plank along the starboard gunwale that’s painted white and slopes down to the water and a vertical net along the portside gunwale. Close to dawn during low tides, fishermen in these boats will drift silently near the banks. Fish on encountering the white plank will be surprised and try to jump over it. They will hit the net on the other side and fall back into the boat. The last two boats to be illustrated here are huge outdoor exhibits. Both are houseboats, the first is a boat that is constructed and second is a dugout! Both these boats were meant for long journeys made with entire families living on board. Rua Kang Kradan is built from planks (kradarn), it’s a flat-bottomed boat with a broad hold for cargo and accommodation. There a small house-like structure in the centre of deck and two flat roofs, one at the bow and the other at the stern to shelter the two oarsmen. Such boats were water-born provision stores selling dry goods to the waterside communities, an essential service before we had mini-marts, super markets and convenience stores. These boats are operated mostly by Muslims vendors and their families lived on board during these trips. 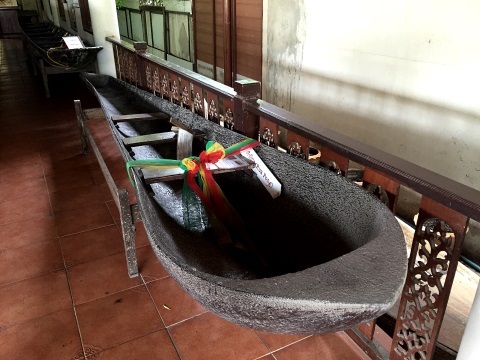 Rua Mang Pong or scorpion tail boat is a huge dugout with a long stern that curves upwards, hence its name and a bow that protrudes forward. It also has a little house on the deck and a sheltered area under a flat roof at the stern for the coxswain. These boats are used for transporting goods along the Chao Phraya River between Northern and Central Thailand. Journeys for these goods and trading boats can take months with families living, eating and sleeping on board. 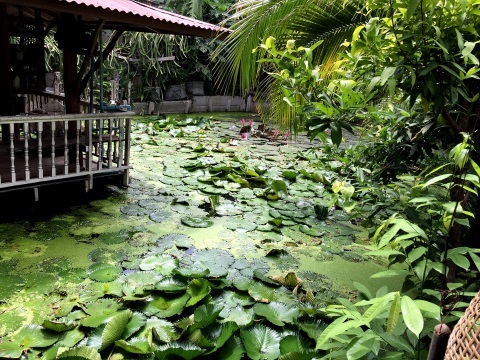 The museum is located in a traditional Thai house with a beautiful garden and pond giving a scenic and peaceful atmosphere for the visit. From this account of Thai boats, their features and functions, the reader gets an idea of what life was like in old Ayutthaya and Siam in the early 20th C and before. Waterways were the main thoroughfares and boats of all shapes and sizes were the vessels of transport in everyday life and commercial activities. 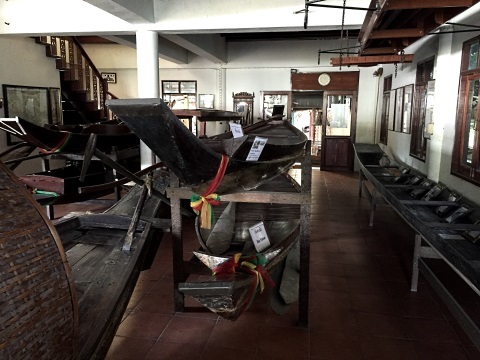 We are grateful to Ajarn Paitoon and his wife Khun Rattana for their hospitality and for giving us the opportunity to see these rare exhibits of traditional Thai boats in their home museum. 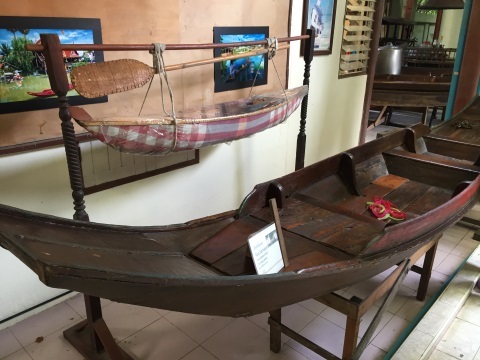 They also provided me with an information brochure on the Thai Boat Museum and a booklet on the different types of traditional Thai boats used in the days of old, both of which were of invaluable help in writing this article. It’s a singular honour to be able to meet a man with a passion to commit his life’s efforts to preserve the memory of a way of life in his society. These are the remarkable individuals who will always be an inspiration to others to aspire not for fame or fortune but for the labour of love. From Bangkok get on the Don Muang Tollway (Highway 1) – Highway 32 – Highway 309 which will lead to the heart of the old city of Ayutthaya. You can either get to the museum via Bang Ian Road or Ho Rattanachai Road. The museum has entrances located in both these roads. Open every day, from 0900 – 1600 hours, visitors are requested to call in advance. For group tours, arrangements can be made in advance for guides in English or Thai. Admission is free but visitors are welcome to make donations for the upkeep of the museum.